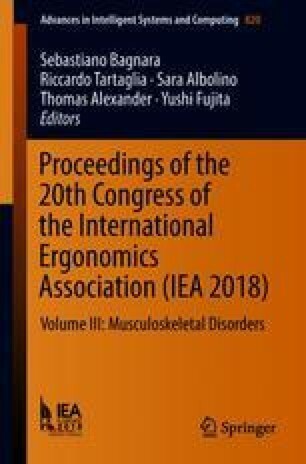 Introduction: Although the risk of upper limbs repetitive movements of cashier workers is clear in the scientific literature, there are still very few studies providing a comprehensive risk assessment for all supermarket jobs regarding musculoskeletal conditions due to repetitive movements. Methods: An organizational analysis of 5 supermarkets was carried out onsite to determine the duration and content of the shifts, i.e. to identify which tasks entail a potential biomechanical overload and how they are assigned to homogeneous groups of workers. A total of 67 tasks were identified and analyzed. Each individual task carried out by supermarket staff was analyzed and filmed. The videos were later assessed using the OCRA checklist, for both the right and left arm, to calculate the intrinsic task risk. Result: Based on the evaluations, risk of upper limb musculoskeletal disorders is often “medium” and sometimes “high” (e.g. deli counter and butcher) among full-time workers; for part-time workers risk is often medium/low red or borderline (yellow). Discussion: The analysis of the exposure to repetitive movements should be performed based an exhaustive organizational analysis. This kind of study will contribute to manage this risk and improving working conditions in an effective way. More research is needed to identify the best mathematical model to compute the weekly risk score.